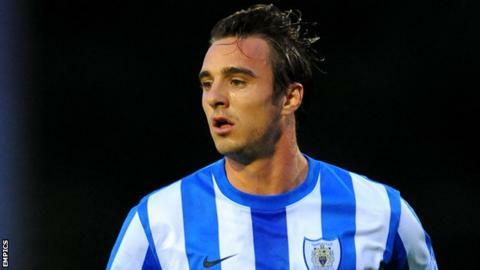 League One strugglers Bury have completed the signing of defender Euan Holden on non-contract terms. The Shakers remain in the relegation zone, despite winning for the first time since 20 November on Saturday. After seeing his side move within a point of safety, manager Kevin Blackwell told BBC Radio Manchester: "We've given ourselves a chance to get out [of trouble]. "When you're 14 points adrift of safety and seven from getting off the bottom, it's a long way to crawl, but we're crawling, we're fighting and we're playing some good football at times. "What frustrates everybody at Bury, having seen us play, is how many chances we've been creating in games and [if] we'd have had someone like 'Bish' up top, we might be sitting comfortably in mid-table now. "Nicky Ajose's known for his attacking play in the final third, but his defensive display was absolutely first-class. I thought he was fabulous. "He's gone to a few other clubs and it's not happened. Everything that people have said he couldn't do, he did it on Saturday, so he can do it. But he obviously wants to do it here."